Jay Rattman is barely 30 but already has the career of a seasoned professional, with a discography of over 25 records that includes “Urbanus” by Stefon Harris, nominated for the 2010 Best Contemporary Jazz Album Grammy, and “New Celebration,” the last big band album by NEA Jazz Master Phil Woods. 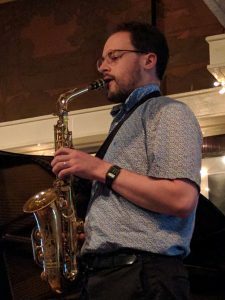 A multi-instrumentalist improvisor and composer in New York City, his musical sensitivity and spontaneity have placed him in demand in a wide range of settings from contemporary classical chamber music to early jazz, klezmer, creative improvised music, straight ahead jazz and everything in between. He has performed at most of the major clubs in New York in addition to the MoMA, the Coachella Festival, Red Rocks Amphitheater, the Late Show, and the Tonight Show. As an educator, Rattman maintains an active private studio in addition to having taught group instrumental lessons in New York City public schools through Manhattan School of Music’s Educational Outreach initiatives, via distance learning from Manhattan School of Music, in Tunisia through the Jazz Club de Tunis in partnership with the U.S. State Department where he directed the student jazz orchestra, and as a founding faculty member of COTA Camp Jazz. He also presented in a teaching artists masterclass with Yo Yo Ma and his Silk Road Ensemble. For more, see Jay Rattman.com.